Forget Disney World, I'm Going To Diggerland! | OhGizmo! If you’re a fan of heavy earth moving machinery, I’d suggest canceling that Disney World trip you have planned, and instead take the family to an even more magical place known as Diggerland. As far as I know it’s the only ‘theme park’ in the world where kids and adults can drive and operate real construction equipment including back hoes, dump trucks and all sizes of diggers. And surprisingly while you’d expect to find a park dedicated to heavy machinery in the US, it’s actually located in the UK. But seriously, while I probably wouldn’t plan a family vacation around Diggerland, I still think it would be really cool to spend an entire day playing around with gigantic toys like these. (Legally, that is.) I mean how many times have you walked past a construction site at night and wondered if someone has left the keys in the ignition of that giant excavator? If I was the only one then I don’t think a place like Diggerland would exist. Yes, imagine that. We also have hot and cold running water and electricity here too…. WHAT!?! When did this happen? Next thing you’re going to tell me you finally have TV too, but need a license to watch it. The song on their homepage is freakin priceless. Thank goodness, at first I thought the park started with an “N”. 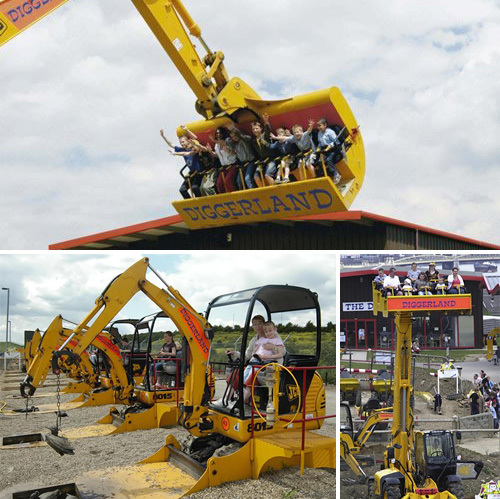 Diggerland is a fun day out for the family but the adult-only experiences are where it is at! I’ve put together a list of them at http://www.diggerracing.co.uk/ . They need to be pre-booked but racing in a JCB digger is awesome! The dumper trucks are tricky to master but equally good fun and the driving day lets you dig massive holes! All of these are designed for adults and are perfect for men and women alike!